Well, when we left for our spring break adventures, I certainly didn’t intend to take such a long hiatus from the blog. Little did I realize how busy we would get upon our return. I’ll be back in a few days to share our adventures, give a few updates and then we’ll launch into some cooking around the world again. For today, however, I figured I would provide a little flashback to our first year of blogging. You see, I was reminded by Charlie Louie at Hotly Spiced that today is ANZAC Day, a day of remembrance for Australian and New Zealand veterans. She shares a fabulous story of her grandfather in WWII, so in honor of him and all veterans, here’s our ANZAC post from three years ago. Cheers! As promised, we have one more delicious recipe from New Zealand. I think that to-date this has been my favorite cooking destination on this adventure and I know that many of these recipes will become part of our regular rotation. 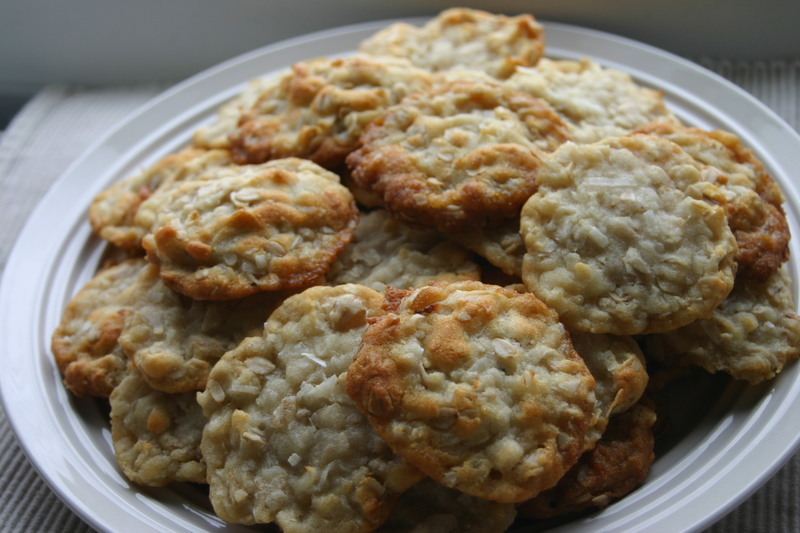 Earlier this week, Mr. N and I baked up these little gems – ANZAC Biscuits. Mr. N is in the driver’s seat for the next few weeks and he’s picked for us to cook some meals from Mongolia. I need to go back and look, but I believe that Mr. N has picked an Asian country more than half of the time. He loves Asian foods and if I had to guess, I would say that aside from pizza, it’s probably his favorite type of cuisine (followed by Italian). We laugh about Mr. N’s choice every time because Mike is dying to pick Thailand, but we don’t want to pick two countries from the same continent to follow each other, and Mike always picks after Mr. N. So this time, Mike has asked Mr. N if next pick they can make a deal. We’ll see how that holds up in a month or so. It’s time for the birthday girl’s dessert and you’ll never guess what we found. Remember that Miss A requested (well, okay rather demanded) cookies for her birthday? Well when I pressed her on what kind of cookies she wanted she said, “balsamic cookies.” Mr. N thought she was out of her mind and was horrified at the thought, but Miss A kept insisting on balsamic cookies. So I did a search, and do you know what I found? Not just balsamic cookies, but Chocolate Balsamic Cookies! I thought Miss A was going to fall off her chair she was so excited – chocolate and balsamic and a cookie! She most definitely was on hand to help (and sample) this recipe! 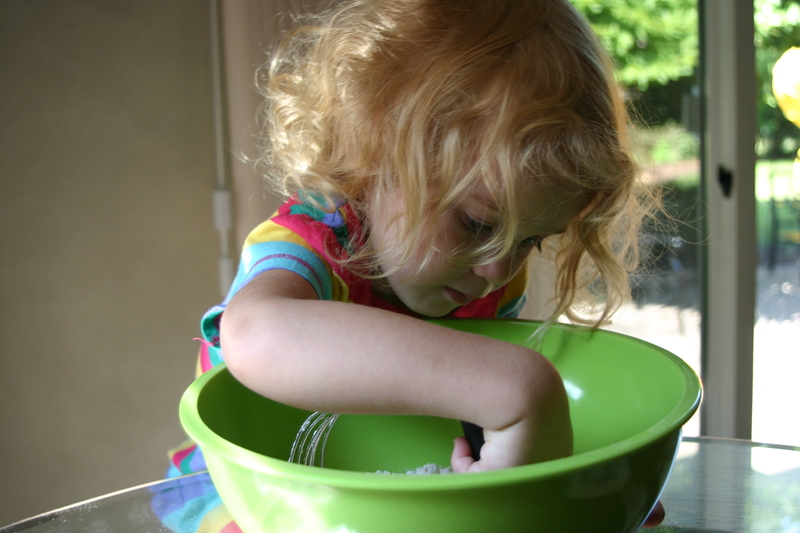 First we sifted together the flour, salt and baking soda.